Any Broadway fan will know that Rent changed the face of American musical theater - bringing in a new era. 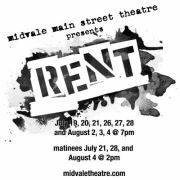 I hold my head high and proudly say that Rent is also bringing in a new era for Midvale Main Street Theatre. All of my readers need to first know that Rent is not for the faint of heart, please be aware it is very suggestive and contains vulgar language...as well as an important message of community and love. Speaking of community - not that this will make my thoughts on the show any more relevant - but I grew up performing with, including a 30-minute montage of Rent, Dan Rosenbaum. Who is Dan? None other than the man who performed the leading role of Roger Davis in the 2004-2005 touring Broadway production of Rent (watch him blow away "One Song Glory" here). He also understudied the role of Radames in Aida. I have performed parts of this show with a Broadway Roger. Now tell me it is going to be easy to impress me when there is that to live up to. Midvale Main Street Theatre presents the modern rock classic that defined a generation, RENT by Jonathan Larson. Based on Giacomo Puccini's opera La Bohème, Rent (the Pulitzer and Tony Award winning musical) tells the story of a group of artists in the East Village of New York City struggling with life, love, AIDS, and the impact they have on America. As the show began, I heard the immediate whispers of my darling friend Leah fill my ears about Roger (Daniel Silva), "He sounds just like Adam Pascal (the original Roger on Broadway). He sounds just like him!" 1. Aleksndr Arteaga as Tom Collins. This young man is phenomenal and blessed with the gift of natural talent. I maybe gushed to him after the show (he is the most humble, grateful sweetheart, in case you are wondering) and he shared with me he has a mere couple of months of training under his belt. This part is about as vocally challenging as a role can get and yet, as an audience member, you will never worry he's not going to send every note soaring through the rafters. I am not exaggerating. His version of "I'll Cover You" left half the audience in tears (you can see everyone wiping their eyes), and touches some place in the bottom of your soul where you rarely let that kind of vulnerability take hold. He's breath-taking. Which brings me to his counter-part. 2. Frank Castro as Angel Dumott Schunard. I see Angel as the character that truly is an angel - the person who teaches love, unity, and acceptance to everyone, as well as living those principles. Not to mention the comic relief. Angel has sass and att-i-tude. Every time I saw Castro enter the stage, I was filled with anticipation for what laugh I was going to get or what musical number with which my ears were about to be tickled. Angel is also the character through whom vulnerability and the fragility of life are conveyed beautifully and tenderly. 3. Carolyn Crow as Joanne Jefferson. Ladies and Gentleman. Wow. This woman can blow the roof off the theater. Every time she sang I just wanted to shout, "Amen!" Her character is the lawyer straight-man to her romantic interest, and wild-child, Maureen. At first, you see this plain-Jane laywer and you could easily dismiss the character. But then. Ohhhhh, but then. She transforms every time she opens her mouth and you root for her. In her duet with Maureen, "Take Me or Leave Me," you will find yourself rooting for team Joanne all the way and then screaming with applause as she exits the stage. Midvale Main Street Theatre has put on some great productions before - think Sweeney Todd or Hairspray. After Hairspray (the best production of the show I saw state-wide) I did not think they could parallel the success of such a cohesive cast, an electric audience, and all-around strength in talent (aka no weak player in the lot). I'm so glad they proved me wrong. And then some. I have seen this show on Broadway and parts of Midvale's production thrilled me more than the professional cast. Not to mention that Rent is a difficult show to pull off in a respectful manner, but I'd say Midvale does it in about as classy of a way as you can with this subject matter. You will be hard-pressed to find an all-around better production of this show at the community level anywhere. You can still catch the show August 2, 3, 4 @ 7:00pm, August 4 @ 2pm at Midvale Main Street Theatre 7711 Main Street. Admission is $15 and worth every penny - buy them here. Both shows last Saturday were sold out, so you will want to make sure you reserve your tickets. I went to college with Carolyn. She's by far one of my favorite people in the world. She's also the reason that I went and saw Rent last week. Also, the guy who plays Roger looks like Bret McKenzie from Flight of the Conchords.